Since we’re in the middle of a series of “The Shadow” episodes starring Orson Welles, I had to check the vault and see if I had his classic rendition of H.G. 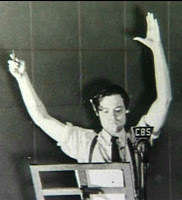 Wells “War of the Worlds”. After all, it just wouldn’t be Halloween without it. This entry was posted in Radio Yesterday Podcast and tagged Orson Wells, Science Fiction, War of the Worlds. Bookmark the permalink.